Soil science might sound like a dull backwater of research but its work is ever more essential. As the world grows increasingly concerned about how climate change will affect food security, the United Nations has declared 2015 the International Year of Soils. During the 1920s, soil science was an area of vibrant research, especially in the United States. In 1927, the scientists' new professional association, the International Society of Soil Science, held its inaugural meeting in conjunction with the congress of the International Union of Soil Scientists (IUSS). President Calvin Coolidge underscored the topic's importance in his remarks during the IUSS opening session. One need only "reflect upon the extent to which all mankind is dependent upon the soil either directly or indirectly for food, clothing and shelter," he emphasized. "Long after our mines have ceased to give up their treasures...the soil must continue to produce the food necessary for feeding the ever increasing populations of the world." From June 13 to 22, 1927, conference delegates gave and listened to scientific papers, as well as visited local sites. A bus trip to Baltimore, Maryland, on June 21 even included viewing "a virgin profile of Leonardtown silt loam, exposed by a road cut." The guide pointed out the area's characteristic layer of clay, which these agricultural specialists knew could make the soil "cold and waterlogged in the spring and droughty in the late summer" and therefore impede plant growth. As the guide noted, "It is said that George Washington learned to swear while farming this soil. Do you wonder?" That reference to the first American president was not accidental. On the previous Saturday, June 18, many delegates had boarded an excursion boat and traveled down the Potomac River to visit Mount Vernon. Watson Davis's photographs of the participants preserve a record of that pleasant summer day. Davis photographed several participants who had come from abroad, including the leaders of the Russian delegation. Konstantin Dmitrievich Glinka, director of the Agricultural College of Leningrad and Experimental Station and a well-respected member of the Russian Academy of Sciences, was one of the organizers of the Washington conference and had just been elected president of the new society. Vladimir Vasilevich Gemmerling was the first dean of the department of geology at the University of Moscow and director of the Regional Moscow Experiment Station. A. A. Yarilov was on the faculty at the University of Moscow and edited the Russian journal Pedology. He was also the society's official historian. A. N. Goodlina, the only woman among Russian scientists on the boat trip, was affiliated with the Agricultural Institute in Gyorky. Jacob Samuel Joffe, a professor in the soil chemistry department of the New Jersey Agricultural Experiment Station at Rutgers, had gotten to know members of the Russian delegation because he translated all their papers. At the conference, talks were delivered in a speaker's native language (e.g., Russian) but translated into English for the published proceedings. Another international delegate was M. Winick, director of the Experiment Station at Mikweh-Israel, whose research focused on soil chemistry and soil bacteriology. Among the American participants photographed by Davis was agronomist James Henry Stallings, an expert on soil fertility and bacteriology at the J. C. Penney-Gwinn Corporation. Stallings later worked for the U. S. Department of Agriculture's Soil Conservation Service. 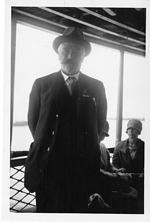 Another participant from the world of commercial agriculture was H. G. Zuckerman, a prominent California potato grower. John Sedgwick Burd taught agricultural chemistry in the College of Agriculture at the University of California. Within a few years of the Washington conference, as documented in Pare Lorentz's 1937 film, The Plow That Broke the Plains, soil science gained new relevance for Washington policymakers. The Dust Bowl had taught harsh lessons about how climate, soil conditions, and agricultural practices affected national well-being. Today's soil scientists are more likely to be on Twitter or Facebook than to take slow boats down the Potomac. They are also increasingly sensitive to the larger social and cultural context for their work. At the 20th World Congress of Soil Science, which met in South Korea in June 2014, a lively art exhibition and film screenings demonstrated how artists and scientists are working together to communicate about the importance of soil science.